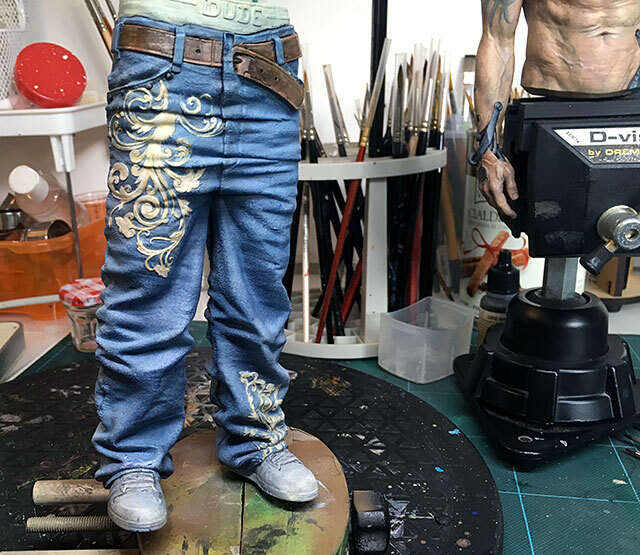 New project – Keos Mason’s “Daddy Figure”. I’ve been wanting to have a go at this for a while. First impressions: the production is absolutely superb. Came in foam lined case with extra foam padding in delicate areas. Small parts individually wrapped in a cotton wool type material. A small part of the dog’s mane, delicate hair strands, snapped off. Otherwise perfect. No mould lines at all that I’ve seen so far and super sharp. 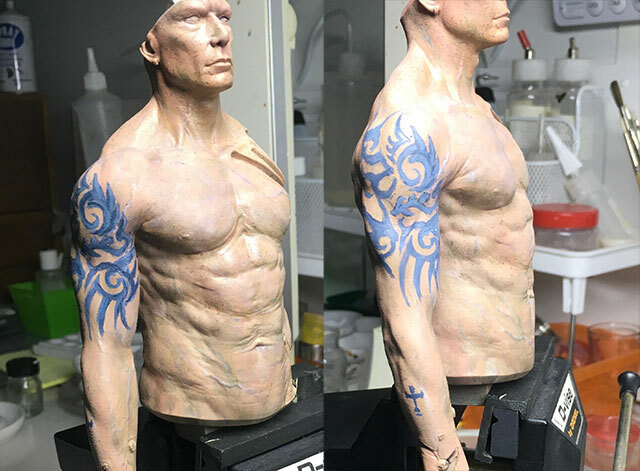 One objective with this project is to experiment with image transfer – specifically tattoos. I’ve printed out a sheet of Japanese designs on both ordinary and special transfer paper, but I don’t think they’re right. I wanted this to be muted tonally in feel. Need to do more research. Ideally LA gangster tattoos – Crips style – but not too crude. 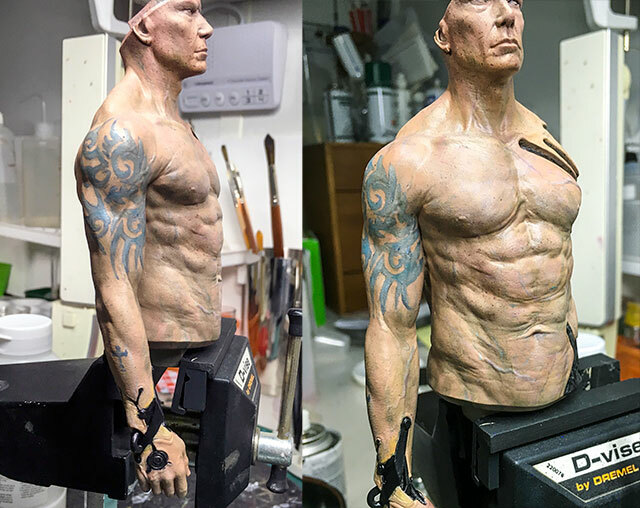 Starting to build up skin texture with speckling. I learned this from a Jordu Schell tutorial but a guy called Bully who sat next to me at a recent Alfonzo Giraldes masterclass and gave me some useful airbrush lessons, has done quite a nice YouTube video on speckling and veining – worth checking. 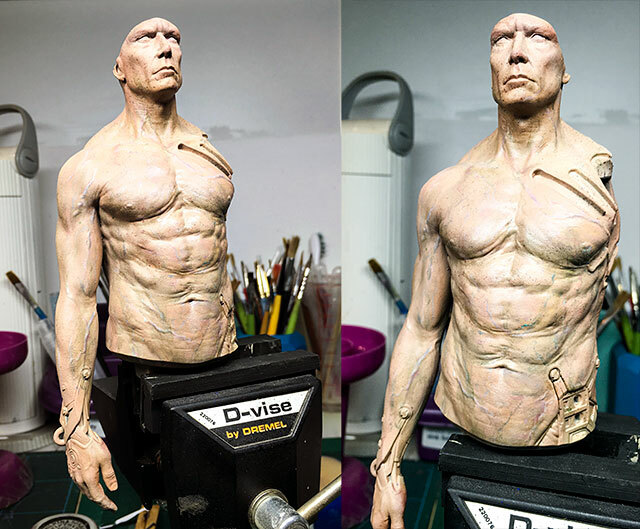 Torso after airbrushing and a little bit of shading with olive green ink. More to come, perhaps with oils and/ or alcohol ink. I’ve chickened out of the whole transfer idea. I tried moulding bits of paper around the arm and couldn’t do it without creasing the paper. I’m also worried that however I do it, I’ll end up with ridges from the edges of the transfer. So – I might try a freehand design or possibly using some of the tribal tattoo stencils I have. Used a set of vinyl tribal tattoo stencils which were very tricky! 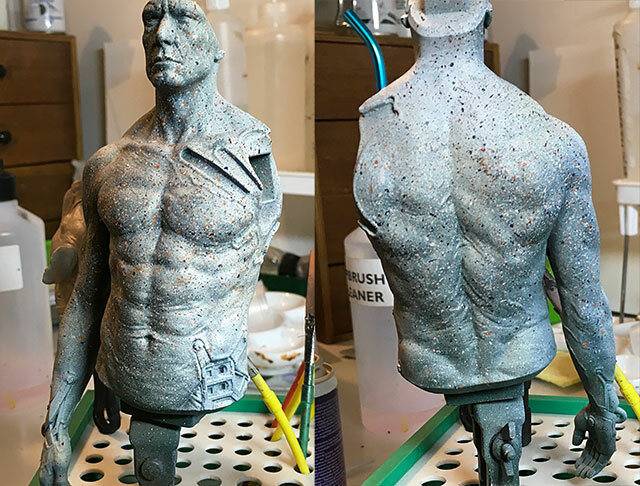 Rubbed off a lot of the paintwork on the chest and shoulder which didn’t work. These are not right either but hopefully can be knocked back. I will probably repaint them in a much paler blue grey before I seal them. 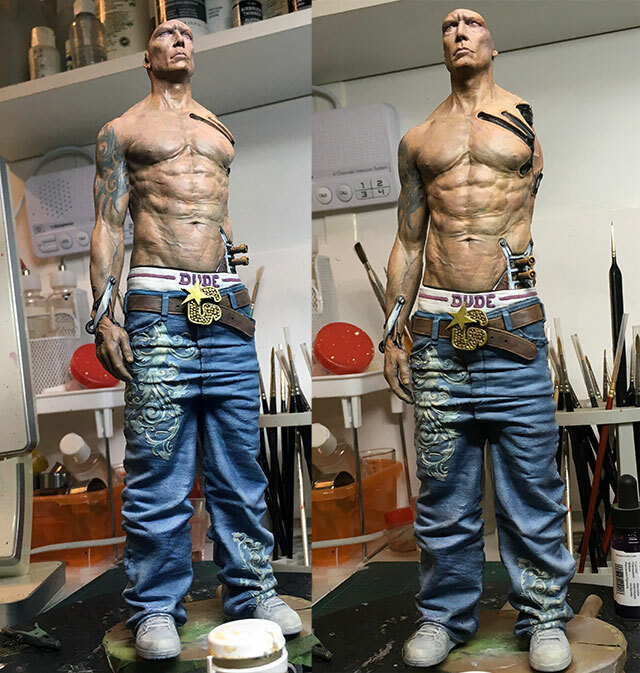 Knocked back with an airbrush. I could fiddle with them more but time to move on. I background lined the robot implants with Payne’s Grey ink. I don’t want it all to be metallic so need to think of a colour for the ‘tendons’ and panels. Perhaps a silvery grey with bits of blue. Jeans and belt mostly done except for the buckle and the embroidery. 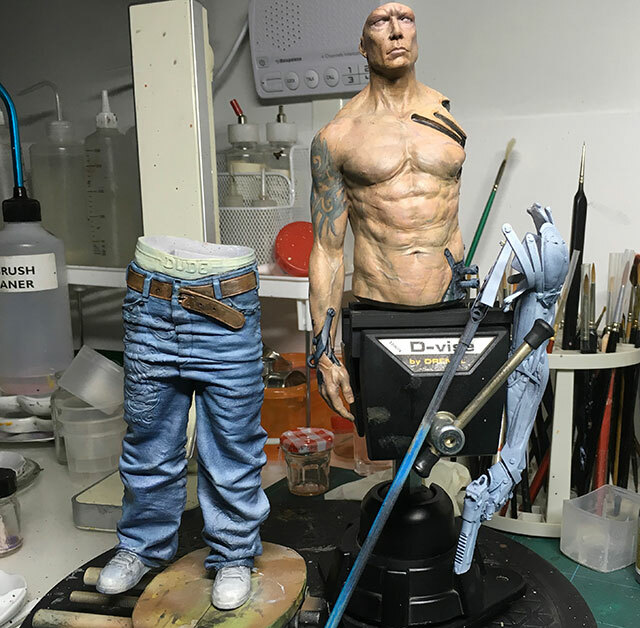 I airbrushed the jeans and the cybernetic arms of the man and the dog. Meant to zenithal shade them only but I, ahem, got a bit carried away – kept adding more and basically greyed them out. Working under a strong lamp, I find you can get mislead by the shadows cast, especially when you’re working with black or grey. Oh well. The objective is to attempt a steel NMM so I’ll have to hand shade them instead. The embroidery is time consuming and looking far too cowboy. Beginning to think I should have done a light blue. I’ll try to knock it back – way back. One breakthrough – found a rendered image I’d forgotten I had which contains a lot of the ideas I had. Must have absorbed them subconsciously. I like the white webbing especially and will use that. May abandon the NMM idea and go for metallic paints instead. Mmm . . .
Dry assembled and one thing is clear – he TALL! Watusi tall. 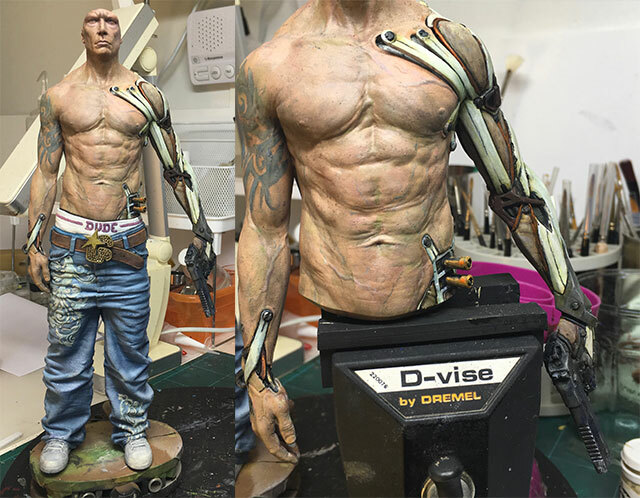 Maybe it’ll look more balanced with his cybernetic arm. I’ve wasted a lot of time on choosing colours so far. First the shade of the webbing on the cyber bits, then the colour of the piping on his underpants. 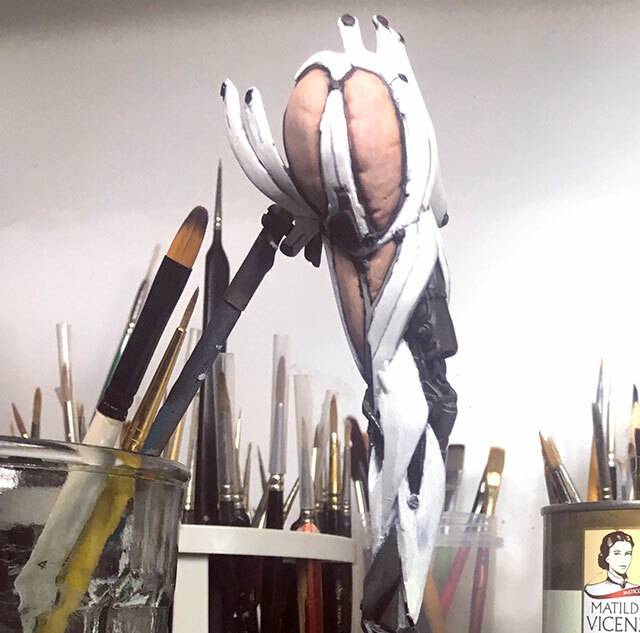 I’ve found a reference picture I like for the cyber grafts where the webbing bits are pale green-white with little bits of red brown rusting but I’m not sure if it’ll work. Was originally thinking a blue grey – sort of shown here. The boring bit for me because I don’t do precise well. I blackened my arm with an oil wash which works for the machine parts but not so much for the webbing. 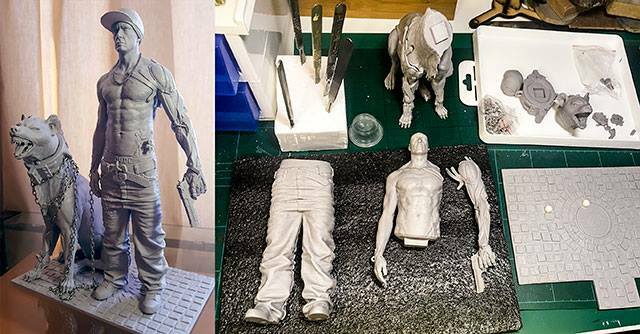 It’s taken layers and layers to whiten them again – and this is just the undercoat! 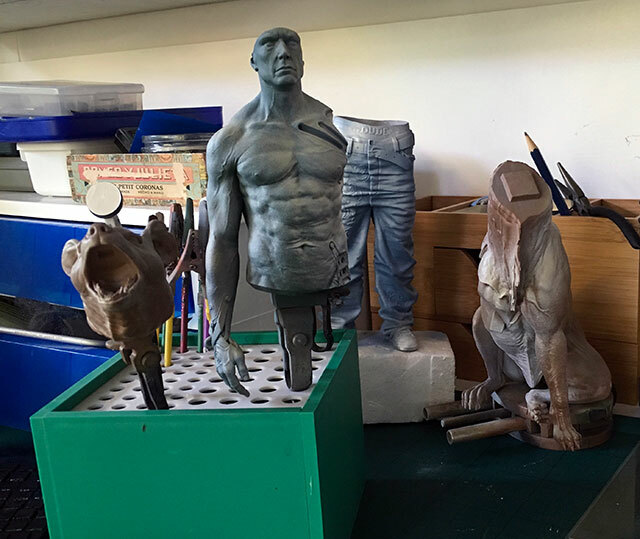 The fleshy bits similarly are just an undercoat. Thought I’d start with flesh but aiming for a rich plush plum or something. Trouble is I don’t know what I’m doing so everything takes longer. Due to landscaping work, I haven’t had a lot of access to my work room lately and progress has slowed down. I’ve also spent much longer than I should on the arm. First I succeeded in corroding the paint by using alcohol inks – it was insufficiently protected by Dullcote so I’m using a water based AV varnish. Then I cant make up my mind about the colours, particularly the padded bits. I was going to darken it but might stick with the leathery texture. The grungy look is winning me over. Rivets and bolts will be metal polished. It’s also not fitting as well as it did so I’ll need to heat it and bend it before I glue it.